The definitive edition (1987) of the piano teaching classic. Includes an introduction by the composer's son Peter Bartok. 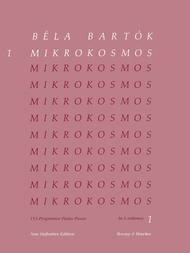 In 1945 Bela Bartok described Mikrokosmos as a cycle of 153 pieces for piano written for didactic purposes, seeing them as a series of pieces in many different styles, representing a small world, or as the world of the little ones, the children. 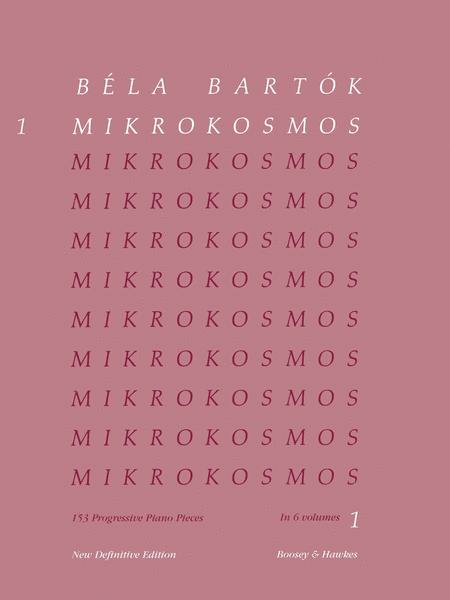 Stylistically Mikrokosmos reflects the influence of folk music on Bartok's life and the rhythms and harmonies employed create music that is as modern today as when the cycle was written.ngarian. The 153 pieces making up Mikrokosmos are divided into six volumes arranged according to technical and musical difficulty. Major teaching points highlighted in Mikrokosmos 1: Unison melodies, Question and answer, Imitation and Inversion. , modes and layering of two different key signatures between left and right hands. Musical forms include canons, inventions, theme and variations and more while time signatures range from simple 4/4 time to 6/4 and 3/2. When supplemented with a good theory book and another beginning book such as Suzuki volume 1, students of Mikrokosmos will become intelligent, thoughtful piano players with a mature sense of musical line and direction and advanced hand independence. I love Mikrokosmos! This is a wonderful beginner's series for the adult student and can also be used for children who are studying the piano seriously. However, I would recommend a prep series and a note speller before assigning this volume to children. Everty piece in these volumes is a tiny masterpiece. What an act of love Bartok this was for his young son. Amazing what the child can learn here, even when his hand is quite small. only thing that can be frustrating for beginners is the metronome numbers given; I never got to that speed. Now after two years of practice, I use the summer vacation to start all over and play them at the mentioned speed. 41 of 71 people found this review helpful. March 26, 2009 Excellent for piano and lever harp. teacher 54 years ago had had access to this series. I am using Volume 1 as exercise for my Lever Harp students, for easy sight-reading, exercises for two-hand dexterity, and for practicing crossing over and under. Best material I have found for this use.